Ken Kesey : 1935 – 2001 ‘s tribute. 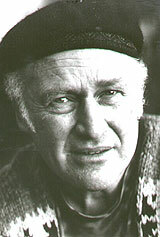 home » Pop Culture » Ken Kesey : 1935 – 2001 ‘s tribute. I carried around a dog-eared copy of One Flew Over The Cuckoo’s Nest my entire sophomore year of high school. It is hard to admit now, in print, but it’s true. I’d already read the damn thing twice, but hoped, in some strange way, that the spirit of it would somehow work its way into me. I tried a similar move with The Great Gatsby, but that didn’t take. Not that Cuckoo’s Nest took in any conventional or tangible way, it’s just that it spoke to me in modes that I needed to be spoken to. It is hard to fully impart that experience now, some 25 years later, but needless to say, it was influential in all that word denotes. It was training of the first degree, a lesson in language and metaphor as bazooka, and for that I will forever be grateful. You see, young writers love Cuckoo’s Nest, because there is a freedom there, a real sense of creative liberty. And with liberty there is the wonderful feeling of danger and confusion, and all the elements of great art, the kind of stuff that makes a young man feel alive and worthy of wasting his time in front of a typewriter or with a musical instrument or any form of creative expression. It’s like when the Jazz guys talk about Coltrane or Monk or Miles Davis or the paint crowd creams over Jackson Pollock’s colorful mess. There is a load of that same stuff in Jack Kerouac’s On The Road and Hunter S. Thompson’s Fear And Loathing In Las Vegas. These are books that scorch the eyes and twist the brain, but, for me, they came later. Cuckoo’s Nest, and soon after, Kurt Vonnegut’s Slaughter House Five were first for me. And firsts; first kiss, first sunrise, first time behind the wheel, first drink, first night on the beach, first ballgame, first published work, first true love; these are the memories that stick and jab and keep coming back to remind us that we feel, that we live. Ken Kesey was one of those wonderful confused danger addicts who could create something of this kind because he felt life to the core. And Cuckoo’s Nest was his manifesto. Critically, his second novel, Sometimes A Great Notion received more noise, but Cuckoo’s Nest was immortalized in film and theater, and has an edge to it that is eminently American in its reach. It is free and wild and has an open air of possibility that reflects what is truly great about the American literary spirit; check that, the American spirit, period. If Kesey had merely written Cuckoo’s Nest – he compiled the notes for the book while volunteering for LSD experiments and then working as a psychiatric aide at Menlo Park Veterans Administration Hospital – there would have been sufficient enough evidence that he was comfortable teetering on high wires. But Kesey lived his art in the same fashion, by being the honest troubadour of lunacy and mayhem, the quintessential Californian jester, the clown prince of whimsical release. His gift was harboring energy, not letting it go. He could let it engulf him, channel it, and make it into a book, make it into Cuckoo’s Nest. Kesey was one of those nine lives types, a genetic mutation of Baby Boomer angst and good old-fashioned Great Depression bravado. Sadly, many of those lives were spent jerking off around Mexico in a drug haze, or sitting as the Grand Poobah of a lost gaggle of hippies in the California Mountains. But even then, Kesey used the foul nature of the beast as performance art – the precursor to Andy Kaufman – in what he called the Merry Pranksters. You see, young writers love Cuckoo’s Nest, because there is a freedom there, a real sense of creative liberty. And with liberty there is the wonderful feeling of danger and confusion, and all the elements of great art, the kind of stuff that makes a young man feel alive and worthy of wasting his time in front of a typewriter or with a musical instrument or any form of creative expression. Ah, the Pranksters. Never has a more meaningless endeavor culled the imagination, while demonstrating how a warped cross-country bus ride could capture the pointless rebellion of youth with hallucinogenic stupidity. It was less fun, than militant madness, a stretch of mind-swelling, spiteful counter culture hyperbole. And it was fueled by Kesey’s formulaic mania, sometimes satirical, sometimes emboldened farce. But a mere prank was never really Kesey’s style. He was what a very good friend of mine calls the “balls to the wall” mentality. Kesey rode the sucker to the bitter end, or in this case, New York’s World Fair. Filmed the whole thing. Naked, painted hippies, bikers and the human match stick, Neal Cassidy behind the wheel, it was the true movable feast, a happening, a ruckus. Tom Wolfe came along for the ride. He wrote a book and called it The Electric Kool-Aid Acid Test. The high brows called it the new journalism; Wolfe became a famous novelist, Kesey became an infamous one. Kesey said a great deal of smart and insightful things about spirituality and politics and art and literature, but that was buried beneath years of drug busts and insurrections of varied kinds. The jester routine wore thin. The maverick became the caricature, and then some kind of Buddha for the sixties generation of aging optimists. And Kesey welcomed all monikers. He didn’t have a name for any of it. To Ken Kesey, it was just life worth living until the end. The end always comes too soon for the hearts of fire. I have another copy of Cuckoo’s Nest somewhere. Maybe I’ll give it to my godchild, Nicole when she’s fifteen.